Sometimes pepperoni and cheese can get a little old. Don’t get us wrong, we are fans of a classic, traditional pizza. But we also love spicing things up a bit (sometimes literally) and adding in a few unique ingredients. Remember: unusual and unique doesn’t necessarily mean gross. In fact, some of these innovations will have you asking yourself why you hadn’t thought of these pizza masterpieces earlier. So here are some of the most unusual, but delicious, pizza toppings we have heard of. Don’t knock ‘em ‘til you try ‘em! Although both chicken and cheese are common pizza toppings, blue cheese and buffalo chicken might be a little more of a rare find. But believe us — this new twist on your typical cheesy pizza is sure to have you coming back for more. This is for the truly fancy pizza enthusiasts. Prosciutto is actually quite common on pizzas in Italy, pizza’s motherland. Topped with figs and caramelized onions, you really take pizza dining to a whole new, refined level. This combination seems like an obvious winner. We put bacon and avocado on our other dishes, it was only a matter of time before we put them on pizza. Our only complaint is that we don’t find this combination as often as we’d like! If you’re a pineapple-on-pizza lover, we have just the pizza toppings for you! Instead of the common ham and pineapple, try switching out the meat for jalapeno peppers. It gives your pizza a real kick that compliments the pineapple perfectly. This is another combination for all you fancy pizza lovers. Seafood is an amazing and underappreciated pizza topping. Most seafood pizzas use shrimp, but this one goes all out with butterflied prawns, complete with pesto and mushrooms, making this one of the most savory pizzas we have ever heard of. You already put cheese on your pizza, why not put on the cheesiest topping of all? Mac n’ Cheese pizza is gaining popularity, at least in the unique pizza toppings category. The combination of pizza crust and pasta is something we can only describe as carb-loaded and delicious. 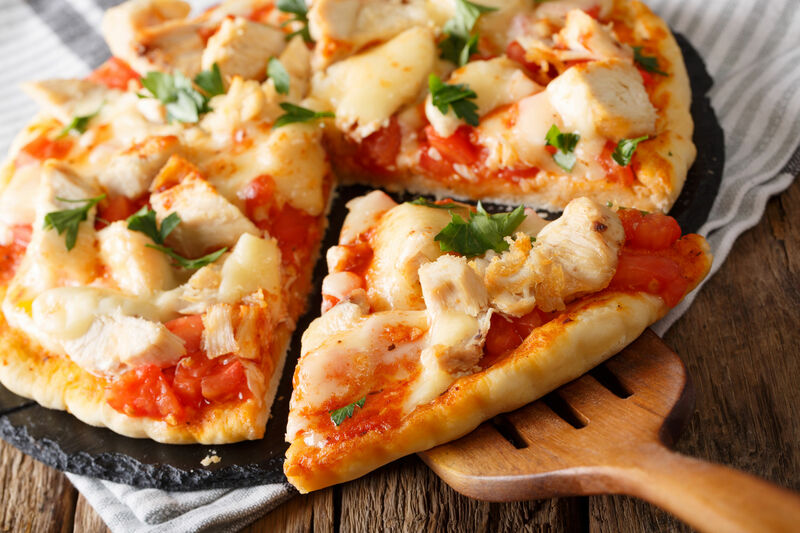 Another seafood topping, but this one is sure to appeal to a wider range of pizza lovers. Switch out the old tomato sauce with alfredo, and top with shrimp and fresh tomatoes — voila! You have a seafood pizza to die for. Taco ‘bout tasty (sorry, we couldn’t help ourselves)! What can go wrong when you combine two amazing foods such as these? Top your pizza crust with taco meat, olives, lettuce, tomatoes, and all the rest of your favorite taco toppings! Sprinkle on some crumbled chips at the end to add the perfect crunch to every bite. We have another for the pineapple lovers. Except this time, we are replacing pineapple with mango to keep that sweet and tangy punch that we love. Pair the mango with barbeque bacon to keep the sweet and tangy vibe going. It’s the perfect solution for those of us who love tropical fruit, but want to shake things up a bit. This might be our most unusual pairing of pizza toppings thus far, but hear us out before you cringe with disgust! Sliced apples are becoming more and more of a favorite, giving a slight tang and sweetness that other fruit on pizza offers. It also adds a light crunch, which we find to be just right. Switch out cheddar for goat cheese and caramelized onions for this unusual, but surprisingly perfect combination. Whether you’re a fan of the traditional or the unique, come to Pizza Factory to satisfy your pizza cravings with all our delicious menu items! No Comments to "10 Surprisingly Delicious Pizza Toppings"